Once in every college generation since 1924, the faculty and staff perform Lewis Carroll's Alice in Wonderland for the students. Students are hard-pressed to identify their elaborately costumed instructors who act out this literary fantasy. The next performance is scheduled for early 2020. Each year as the spring semester comes to a close, Meredith celebrates the achievements of its outstanding women at an annual Academic and Leadership Awards program. College-wide academic and leadership awards are presented to outstanding students. In addition, many departments and schools host awards ceremonies scheduled during the second semester. A number of those events, as well as the Undergraduate Research Conference, are held on a day of Celebrating Student Achievement, a tradition begun in 2003 through the cooperation of the Divisions of Academic and College Programs. Three members of the Class of 1970—Betty King, Ayn Sullivan, and Peggy Timmerman—founded The Bathtub Ring singing group in the spring of 1968 and first performed for Phi Luau during Rush Week. Their blend of rebellion against and honoring of Meredith traditions has made The Bathtub Ring a perennial favorite at Cornhuskin' and other campus events. Membership is by audition, and selections are made by The Bathtub Ring from students who are members of even-year classes. The Big Sister-Little Sister program forms lasting relationships that help underclass students adjust to College life. Freshmen may choose to be assigned a junior to be her big sister until the upperclass student graduates. Throughout the year, sister classes participate in events such as ice cream socials, skating parties, pizza parties and class serenades. The culmination of the two classes’ years together is Class Day on which the members of the sophomore class honor their big sisters. (See also Odd and Even Classes and Class Day Activities). The colors of all odd classes are blue and white until their junior year when they adopt ranibow colors. Even classes use green and white. Leap year classes' colors are purple and gold. 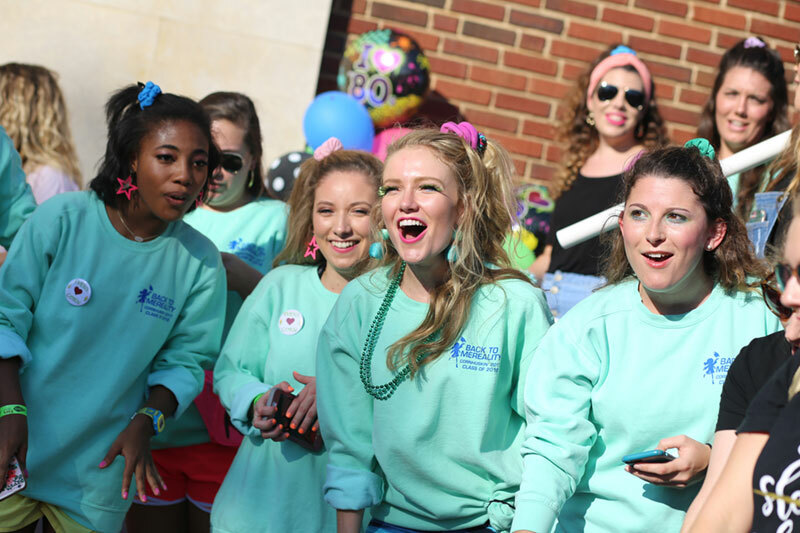 Sophomores honor their senior big sisters, and the seniors highlight their College years on the Friday of Commencement Week. The little sisters spend the morning constructing two 75-100 foot daisy chains to be used for the afternoon's Class Day exercises in the amphitheater. 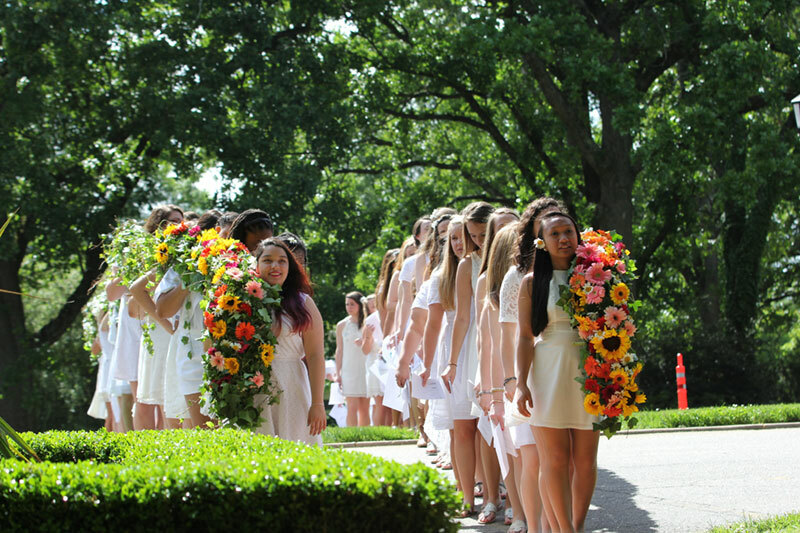 The white-clad sophomores hold two daisy chains and sing as their sister class marches through the chains. Class historians recall and depict key events of the graduating class' four years at Meredith. The sophomore and alumnae sister classes sing traditional songs to the seniors. At the conclusion of Class Day, the chains form the class numerals of the graduating class. The seniors then go onto the island, form a circle and celebrate with their classmates. Each class participates in a variety of annual events. Senior events include a celebration night of the days remaining until graduation based on the class' graduation year, a senior parent night and baccalaureate. Seniors also have the privilege of painting the tunnel below Wade Avenue each year. In the fall, the junior class sponsors a Ring Dinner. At the dinner, juniors celebrate the wearing of their class rings. The sophomores sponsor a Guardian Angel Dance in the fall and Tea for Two and a Charming Evening in the spring. Freshmen participate in the Fire and Water Dinner in April. The Meredith Class Ring was designed in 1953 by a committee including Jean Dula Fletcher, '53, and Ann Lovell, '54. The ring is an oval onyx surrounded by silver or gold with the Meredith seal engraved on the onyx and oak leaves impressed on the band. As an undergraduate, a student wears the ring on her finger with the seal pointing toward her. At graduation she turns the ring around so that the seal "faces the world". Degree-seeking undergraduate students who have completed 60 hours of coursework (typically the first semester of the junior year) are eligible to purchase the ring. Sales are coordinated by the Meredith College Alumnae Office. The Meredith College official colors are maroon and white. The Meredith College official flower is the iris. Loleta Kenan Powell, '41, developed the "Meredith Hues" iris planted around the fountain, near the Cate Center, near the Alumnae House and at other locations around campus. In the fall, each class presents for competition a skit, word parade, a tall tale, songs and a hog-calling skit, all of which are related thematically. The four classes are judged on these performances as well as on apple-bobbing, corn shucking, can art, class attendance and sweatshirt design. The Meredith Pride Spirit stick is given by MRA to the most spirited class. All of these activities comprise the official Cornhuskin' festivities. Additional activities scheduled throughout the week include Big Sis/Little Sis "Bond" fire and theme reveal, the President's Raid, hall raids and Cornhuskin' parade. Cornhuskin' is sponsored by the Meredith Recreation Association and usually occurs during the first week in November. Cornhuskin' rules are available in the Office of Student Leadership and Service. Each spring the seniors hide a wooden crook from the juniors. The juniors, aided by enigmatic clues, spend a week searching the campus for this stick and very rarely find it. If the crook is found, it is brought into Class Day with a black ribbon. If it is not found, the crook is brought into Class Day with a ribbon of the Senior class colors. Crook Hunt rules are available in the Office of Student Leadership and Service. The event was begun in 1906 when the crook was presented by an instructor to the seniors. This elaborate hide-and-seek has been staged annually since it was revived in 1929. Each year, a day is set aside for Meredith to honor its founding on February 27, 1891. Founders' Day is marked by ceremony and celebration. The College's name was changed in 1911 from Baptist University for Women (Baptist Female University, 1891- 1905) to honor Thomas Meredith's work leading to the founding of the College. In 2018, Meredith celebrates its 127th Anniversary. During the fall semester of 2007, the College launched the Avenging Angels as the official Meredith mascot. The four classes are divided into odd-numbered and even-numbered years. "Them Bones" is the song of the odd-numbered year and "Hail to the Even Spirit" is the song of the even-numbered year. On Class Day, members of odd classes wear black gloves on their left hands and give their little sisters wish bone charms to wish them luck. The even classes give their little sisters bags of sticks and stones "to protect them from the Odd Spirit's bone." The Oddballs is a spirit group of four very enthusiastic students in an odd class. To be an Oddball, a student must be a member of an odd class and audition at the end of her sophomore year. Upon being selected as an Oddball member, a student will be inducted into Oddball status at the following Class Day, held the day before graduation. The Oddballs entertain by doing cheers and stunts at Cornhuskin' and other special events. The freshman, sophomore and junior classes sponsor a formal dance in the spring in honor of the senior class. Seniors attend the dance free of charge. All students are welcome. The Meredith Recreation Association (MRA) has sponsored this event of class rivalry since 1915, its form changing from original plays to a variety of recreational competitions. Stunt promotes class unity through class competition, creativity and fun. Points are awarded for each event and are used in determining the overall winner of Stunt. Recent events in Stunt have included bat spin, tug of war, lip sync, limbo, and a three-legged race. The event usually occurs in mid-April. Rules for Stunt are available in the Office of Student Leadership and Service. The Meredith Activities Board sponsors the White Iris Ball, a semi-formal dance held off campus each fall for all students.